The central feature is a cenotaph surmounted by a molded and carved bier which is the prone figure of a fighting man covered by his greatcoat. On each of the flank sides is carved the City of Manchester coat of arms encircled by large laurel wreaths, bound and supported by ribbons. On each of the ends are swords in enriched sheaths and the Imperial Crown in bold relief. On the sides of the cenotaph are two obelisks, on which the dates of the Great War are carved. To the front is the Great War Stone, a replica of the stone of remembrance, it rests on a surround of three steps. 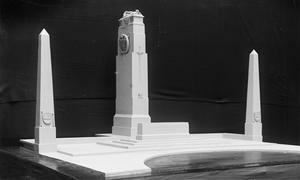 2011: Proposal advanced to move the cenotaph to allow for the laying of a new tram line. The new location proposed for the cenotaph is an area between the Peace Gardens and the Town Hall. The proposal has been controversial and has caused much debate. October 2011 the proposal was approved by the Council. 2004: Cleaned 1949: DATES 1939-45 Added to cenotaph, the area around was also laid out as a garden of remembrance for second world war. Britain at War Ap. 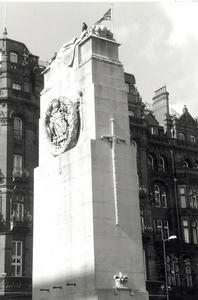 2011 p.8 Plans to move the Cenotaph are likely to go ahead, though the Manchester Evening News website poll shows two thirds of those voting are against the move. The Times 14 July 1924 p.19 Lord Derby and Mrs Bingle, an old lady who had lost three sons in the war, jointly unveiled the memorial.